Cooling specialist Alpenföhn presents their newest addition to the Matterhorn line of performance coolers. Dubbed the Matterhorn Pure, it focuses on delivering the best possible cooling at the best possible price. Even with its untreated surface, the Matterhorn Pure impresses with the same high quality which Alpenföhn is known for. Weighing in at a solid 660 grams without a fan, the cooler manages to impress with plenty of heat dissipation area. But Alpenföhn has ensured, that the material used has been employed properly utilizing the same design as the Matterhorn cooler, but leaving out the Nickel plating to allow the cooler to be offered at the best price point possible. The Pure still offers six heatpipes which make direct contact with the heat spreader of the CPU and thus manages to impress with great performance as well. The double heatpipes are arranged in four rows within the tower of cooling fins, allowing for the air to be pushed freely through the many fins of the Matterhorn Pure. Alpenföhn has also closed off the sides of the cooler, creating a tunnel through which the air can flow, while also adding to the overall stability of the Matterhorn Pure. The asymmetrical stacking of the Aluminum fins of the original Matterhorn has also been employed in the latest version of the cooler. This is the result of two aspects: on one hand a larger number of fins increases the area of heat dissipation, but also adds to the weight and restricts air flow, making a faster and thus louder fan necessary. 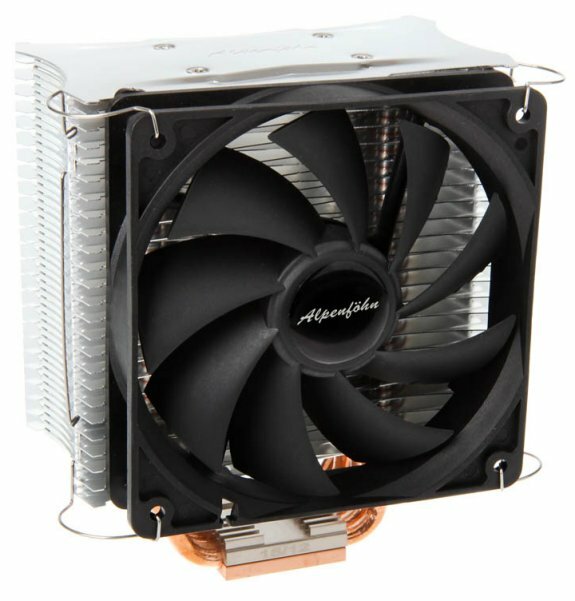 By using an asymmetrical fin stack, Alpenföhn has managed to create a powerful but quiet CPU cooler with the Matterhorn. To keep the air flow at a maximum, while offering a low operating noise, a secondary set of fins have been placed further back in the stack, away from the fan. In this area the air turbulence is lower and thus a quiet fan can still be employed, combining both performance and silence within the Matterhorn Pure. Even without the black surface of the Matterhorn series, the Pure manages to impress, due to the elaborate design and excellent quality. Alpenföhn has ensured that the cooler and its innovations remain untouched, but has included a different fan with the Matterhorn Pure. It utilizes an all black and a bit simpler fan instead of the Wing Boost units found on the original cooler variants. Even so, the Matterhorn Pure still manages to deliver an impressive cooling performance! The fan rotates at 1.500 RPM at most, pushing an incredible 108 m³/h air through the innovative fins of the cooler. Thanks to the PWM connector, the rotation speed may be reduced to a mere 500 RPM by any modern motherboard, at which it operates at a nearly inaudible 8 dB(A). Even though it is missing the rubberized frame of the Wing Boost fans, the fan utilizes four black rubber spacers, eliminating any vibrations, which are hooked between cooler and fan, which eliminates the need for additional mounting materials. This does not only simplify the installation, but reduces the overall price even further. Even though the fan looks a bit simpler, it still offers the same features as the Plus series of the Wing Boost fans, with the ability to connect a second fan to unit. The Alpenföhn Matterhorn Pure ships with all the parts to be mounted on AMD (AM2, AM2+, AM3, AM3+, FM1) and Intel (775, 1155, 1156, 1366, 2011) Sockets. The Alpenföhn Matterhorn Pure Edition CPU Cooler will be available from the 22nd of May for 34.90 Euro exclusively at www.overclockers.co.uk.